Salad Dressing and Dip Mix! 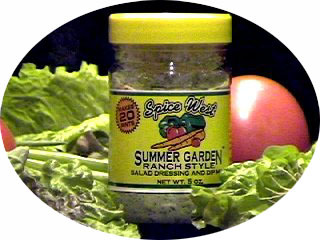 Using Spice West's Summer Garden Ranch Style Salad Dressing and Dip Mix on a piping hot baked potato is just one of many ways this very special dressing can be enjoyed. If preferred, use it dry like salt and pepper to season everything from meats to popcorn. Each of our five ounce jars of dry mix will make up to 20 pints of salad dressing or dip when prepared with buttermilk, mayonnaise or sour cream.